Most people making traditional fried chicken leave the skin on the bird. Not only does it help the breading stick to the meat, but the skin holds a lot of flavor. Heart-healthy cooks, however, are moving toward skinless chicken as a way of cutting down on fat and calories. Even though the thighs are skinless, you can still coat the chicken in some type of breading. To do this, soak the chicken thighs in milk, buttermilk or half and half for 2 hours in your fridge. Mix together your choice of coating. Four cups of flour seasoned with paprika, cayenne pepper, black pepper and salt works best, but play around with your spice rack to find your perfect flavor combination. Remove the thighs from the fridge and dredge in your choice of coating. Shake off any excess and place on a plate until ready for frying. When the chicken is prepped, fill a heavy skillet with about an inch of canola, peanut or sunflower oil. These oils are relatively low in saturated fat, so frying isn't as unhealthy as with other oils, yet they are mild enough in flavor not to alter the taste of the fried chicken. 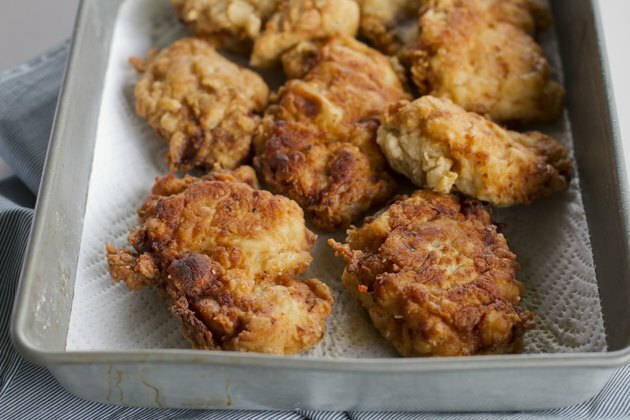 Heat the oil over medium-high heat until it reaches 375 F.
If you're using boneless chicken thighs, fry for 7 to 8 minutes per side until the coating is golden and crispy. If you're using bone-in thighs, reduce the heat to 325 F and fry for 10 to 12 minutes per side. Remove from the oil and drain on a wire rack over a baking sheet to remove excess oil. The U.S. Department of Agriculture recommends cooking all poultry to an internal temperature of 165 F. Anything less than this temperature could expose you to pathogens that might lead to a food-borne illness. If the thighs haven't reached this temperature, continue cooking another minute or 2 per side. Refrigerate any remaining thighs in an airtight container within 2 hours of cooking. Fried chicken thighs keep for about 3 to 4 days in the refrigerator. For chicken stored in the freezer, throw it out after about 4 months. Though the chicken won't spoil, its quality takes a hit after this time.